The popular BBC Radio bobby on the beat. 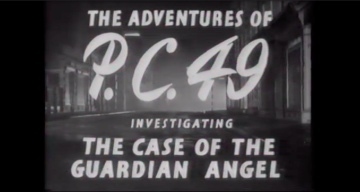 P.C.49, is given the chance to do a spot of plain clothed sleuthing in his screen debut. Taking the identity of a dead criminal, he tours transport cafes(!) in search of a gang of particularly nasty armed robbers. He eventually bumps into shady character Fingers, who introduces him to the villainous Barney, a top member of the gang. But 49 has bigger fish to fry – he is after the ringleader, a mysterious figure known only as “The Boss”. Will our pal Archibald and his plucky girlfriend Joan survive the dangers ahead? This is the second Hammer film to feature Michael Ripper, the first being “The Dark Road” (1948). Ripper became one of the mainstays of the Company’s supporting cast and must hold the record for the Hammer actor with the most number of films to his credit. Patricia Cutts appears to have fled the country after this film, popping up years later as Vincent Price’s faithless wife in William Castle’s notorious 1959 shocker “The Tingler”. Two other regular names turn up for the first time here – Phil Leakey, later responsible for some memorable gruesome make-up creations, and Moray Grant, Camera Operator and, later, a Director of Photography.